Leave a ReviewClammr ItListen in a New WindowDownloadSoundCloudStitcherSubscribe on AndroidSubscribe via RSSDownload Free eBookAnother Call to ActionOne More Call to ActionSign up to the newsletter! You do not have to worry about this anymore! 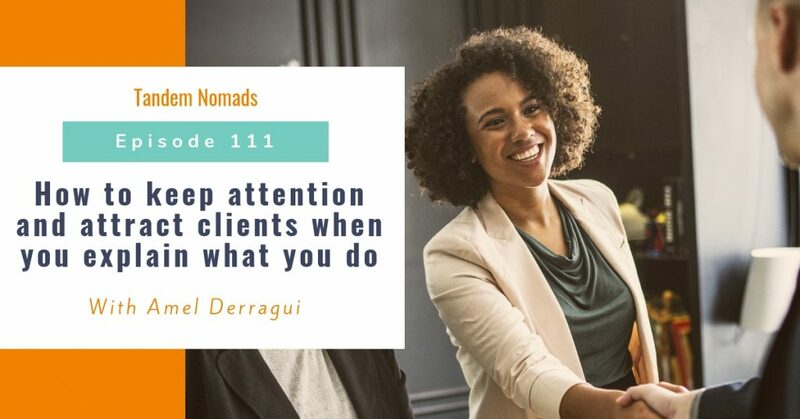 In this episode, I will share with you very practical templates you can use to describe your business, product or service and attract more clients or referrals! Did you learn useful tips in this episode? Please share your feedback below! Listen to the podcast show on your iPhone! Subscribe for FREE to receive new podcast episodes! Listen to the podcast show on your Android! Download the app for FREE to receive new podcast episode! Your support group to exchanges with other expat partners and build a successful portable business! Wow, once again you are surprising us with a new level in your podcast. Astonishing episode 99. This new season sounds really exciting. More episodes! More practical tips! More fields! More male voices! This is amazing. Hooray for Tandem Nomads and thank you Amel for taking care of our community so well. This podcast is a must-hear for anyone who moves around the world to be with one’s spouse! It really helps give me hope and inspiration, as well as practical advice, to build my own mobile business. Highly recommended! An excellent podcast! A must-listen for globally mobile entrepreneurs! I've been listening to this podcast since it first started a few years ago. Amel consistently offers listeners real world, practical tips and ideas for how to manage the ups and downs of entreprenuership as an expat. I've been able to implement many of her suggestions with success - she makes the information accessible, clear and unique to life as a global entrepreneur. Handson, solid career advice for expat partners which really keeps you going! I simply can‘t decide which episode is my fav one because they‘re ALL profoundly researched and delivered eyeopeners. Bulletproof business advice delivered in an authentic, highly empathetic manner which truly helps to dig into those key questions to help you making the next move. Thanks so much Amel for your great work and sharing all these precious expertise. You rock the Expat Partner World with your entrepreneurial spirit 4.0! What a great show! Makes living abroad and running your own business way less daunting. Love Amel‘s approach and how she connects with the listeners. Feel like I know her already! Will be back for more. Lots of information and fantastic content provided by your podcast! Really enjoyed the episode about how to build a powerful community..keep up the awesome work! What a great inspirational podcast. I feel very lucky to be part of your FIGT supporting family. There are many chapters to come, I wish you the very best in your professional journey and in your personal one and everything in between ! Very helpful! Content and host. @2015-2018 Tandem Nomads. All rights reserved worldwide. 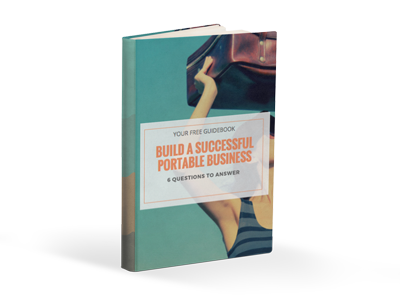 "6 STEPS TO BUILD A SUCCESSFUL PORTABLE BUSINESS!"